Internal curing is a relatively new technique being used to promote hydration of portland cement concretes. The fundamental concept is to provide reservoirs of water within the matrix such that the water does not increase the initial water/cementitious materials ratio to the mixture, but is available to help continue hydration once the system starts to dry out. 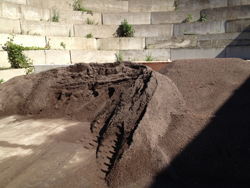 The reservoirs used in the US are typically in the form of lightweight fine aggregate (LWFA) that is saturated prior to batching. Considerable work has been conducted both in the laboratory and in the field to confirm that this approach is fundamentally sound and yet practical for construction purposes. 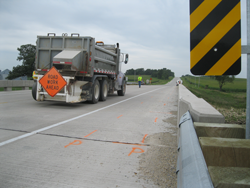 A number of bridge decks have been successfully constructed around the US, including one in Iowa in 2013. It is reported that inclusion of about 20% to 30% LWFA will not only improve strength development and potential durability, but, more importantly, will significantly reduce shrinking, thus reducing cracking risk. The aim of this work was to investigate the feasibility of such an approach in a bridge deck.